Sierra Art Trails is over for this year leaving only a glow of beauty and art in its wake. One of the most unusual artists on the Trails is Wendy Denton, an artist/photographer who honors birds who have been killed on our roads. 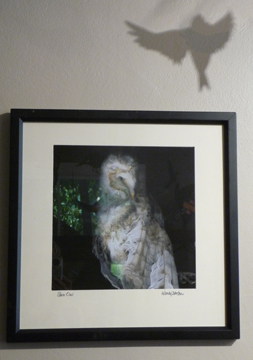 Wendy takes the birds home, scans them and transforms the scans into incredibly beautiful and luminous portraits. I met her last year on Trails and was just mesmerized by her birds. The photos here only begin to capture their beauty. This year Wendy designed an experience for the visitors who came to Queens Inn where she was exhibiting her art. She hung hundreds of bird silhouettes from the ceiling and then invited visitors to write something about hope on small pieces of Post-It notes and put the notes on the bird cutouts. Gentle breezes made the birds fly and by the end of Trails, the display was a captivating vision of hope in flight.